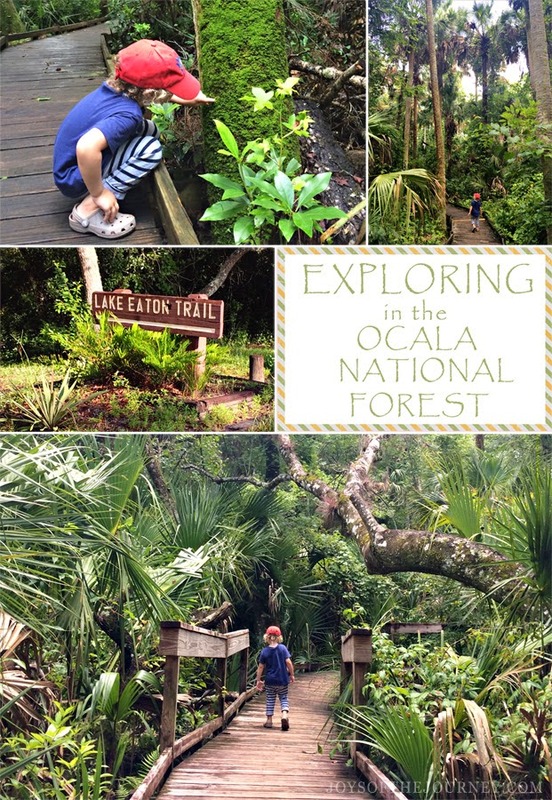 The Ocala National National Forest is an amazing place to explore. With more than 383,000 acres consisting of wilderness and water resources, including rivers, lakes and springs, there are more than enough activities to enjoy. On our trip to the forest this past weekend, we had fun hiking, kayaking, snorkeling and swimming. Our first stop was an off the beaten path hike to Lake Eaton Sinkhole Trail. We drove down a long clay road to get to our destination, going deeper into the forest with every mile. When we reached our hiking destinination, we chose our trail (the shortest, since my little guy gets bored after a half mile each way) and off we went, battling banana spiders and mosquitos every step of the way. The sinkhole was basically a huge hole in the ground that was grown in with trees and plants, and we took the 119 steps down into it. It was pretty interesting, especially since when they first built the steps to the trail, there were 188 steps. Apparently, sinkholes get smaller and smaller and most likely fill in over time! After our hike, we drove to Alexander Springs, where we kayaked down the river. The river was so crystal clear running down from the spring that we could perfectly see the fish and turtles swimming around us. As we went down the river, we saw alligators sunning on the river bank and more turtles happily perched on the branches coming up out of the water. After our river run, we dropped our kayaks off and headed over to the spring. The constant 72 degree temperature of the water was a treat for us after the hiking and kayaking. My daughter and I grabbed our snorkels and made our way to the heart of the spring, which flows at an impressive 80 million gallons a day! It was a beautiful site to behold, with the water flowing through many different sized rock formations. After our swim, we decided to hike the trail which runs along the spring named after the Timucuan Indians that made there home here a thousand years ago. The Timucuan Trail is a one mile hike along a boardwalk, with stops that overlook the spring. It is a beautiful trail lined with tall sabal palms, magnificent Atlantic white cedar trees, which the Timucuans would hollow out and make canoes from, and the scrub palmetto, from which the Florida scrub jays make their home and from which the Timucuans used for food and medicine. My little guy was in awe of the cedar tree and could not believe that people made canoes from them! He asked one hundred questions, many that I couldn't answer, so we will be reading books and searching the internet for more information about it and the Timucuans. It was an enjoyable and educational hike for both my kiddos and myself! I'm so glad that we ventured out for the day to the Ocala National Forest. We had a wonderful learning experience and learning about nature in nature is the best (and most fun) way to learn! It was a great day in nature and a wonderful opportunity to enjoy it with my family. We will definitely be making another trip back to explore more of the forest in the near future! This looks like a great day in the Ocala National Forest. I love your photos! I miss the Ocala. We visited for class a couple times to see the scrub habitat. Lots of fun. What a wonderful exploration!! Thank you for sharing on Sharing Saturday! Were you guys actually snorkelling in water where you saw alligators?? That sounds super freaky! We are planning a trip to florida next winter and are debating doing something like this, but the alligator aspect is kind of concerning. Feel free to shed some light on the topic, I am a Canadian and know NOTHING about alligators. Maybe they just leave people alone?